We toast your stories still being told! We often get asked what is likely to be better for my ensemble – a fully customized tour vs a festival experience. Travel dates, destination preferences and nature of the ensemble are guiding factors that might pull the decision toward a custom tour. Alternatively a director might be keen to have their ensemble interact with a specific festival leader, perform at a major festival venue or sing a chosen masterwork. The term festivals covers a wide spectrum - local festivals we promote, our own festivals featuring KI’s great roster of choral doyens and of course competitions that others stage. Combining a custom & festival tour is easy. 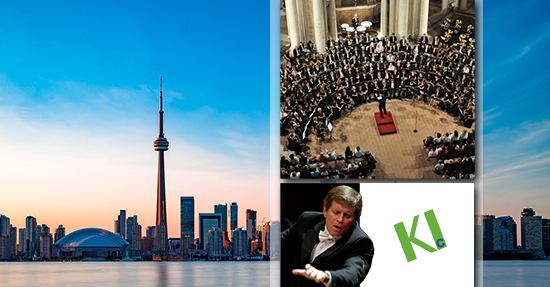 KI’s festival tours are essentially a customized concert tour with: two half days of rehearsals (including an individual concert), a dress rehearsal followed later in the day by the combined concert (which also features our individual choirs staged in their own right). The rest of the each ensemble’s tour is completely customized to individual needs (touring, concerts, exchanges, duration of tour etc.). We would be happy to talk with you about which style of tour (destination and/or festival) suits your ensemble best. It would be great to meet up with you at this month’s Band and Orchestra Conference in Chicago or to chat on the phone if you are not attending this year. It goes without saying that we plan your destination/itinerary/routing with your safety and comfort paramount. I’d welcome the chance to meet in Chicago enabling us to blend your talent, leadership and vision with our contacts, experience and passion for bringing your tour dreams to reality. Be in touch to make a time to meet or for me to call you if you are not heading to Chicago this year. Returning from hosting a director in Morocco/Portugal for his forthcoming concert tour brought to mind how many of our ensembles are interested in destinations a little or a lot off the beaten path. London, Stonehenge and the West End. I am delighted to have two great international festival opportunities to offer you in 2020. One is closer to home in Canada which I am leading with Elise Bradley, Artistic Director of the Toronto Children’s Choir. The other is in the birthplace of so much of our music traditions, Austria, where I will be joining Elena Sharkova to lead the Sing Austria festival. One of my favorite places to have toured with my choirs has been Austria. I love the musical heritage and tradition. The scenery, the food, the people, the sounds… so great! So I am pleased to announce KIconcerts' Sing Austria Festival in June 2020 in Vienna with possible extensions to other Central European destinations. To make this even more exciting, I get to co-conduct with my buddy Elena Sharkova!! If any of you have worked with her, you know she is not only a consummate musician, but a bundle of passion, energy, and love of life!! We hope you will join us in Austria to create a truly magical experience for your choristers, accompanying travelers and audiences alike. Following the success of the 2018 Montreal festival, KIconcerts invited me back to lead the 2020 Toronto Notes of Joy Festival which I will be co-conducting with Elise Bradley. Notes of Joy is a festival for US and Canadian treble and mixed voice choirs. We will rehearse the two festival choirs separately bringing them together for a stunning finale. I welcome the opportunity to work with you and your singers in Toronto in July 2020. Let’s take this chance together to create life changing musical moments for your singers. the vistas and the proud culture. The grandeur of Vienna, sounds of Salzburg, unique charm of Prague and the compelling nature of Budapest. venues, accompaniment, audiences and YOU! Be in touch about these and the 2019 Festivals that still have space for more singers. For those planning 2021 already, Craig Hella Johnson is leading the Ireland Festival that year. I know that many of you are finalizing your concert touring plans for next year and wanted to be sure KIconcerts had forwarded you information on the festival Michael McGlynn and I are leading in Dublin late next June. I can tell you first hand that this festival will be incredible as it is uniquely geared toward a multi-cultural choir experience. In addition to the rare opportunity to sing with members of the Anúna choir, there are limited spaces available for choirs to have one on one workshops with Anúna singers. I witnessed one last year and can speak to the depth of knowledge shared and the impact on the visiting singers! I know your choristers will have a life changing musical and cultural experience. I recommend checking out these YouTube videos to become even more familiar with Anúna and some of the repertoire we are considering. Please take a listen! I was considering a title for the commissioned piece. I had a look at something that would yield a simple SATB with no divisi, and the best way forward is a simple text based on the ancient story of the Blackbird representing the voice of the natural world, with a song so pure and simple that it transcends the sound even of the monk's singing at prayer, or the matin bell. So the title is, simply, “The Song of the Blackbird”. I would love to have you join us for this wonderful choral event, different from any other! If you have any questions, please don’t hesitate to contact me!! I would love to have you and your choir join us!! I hope the start of your academic/singing/concert year is smooth and energizing. 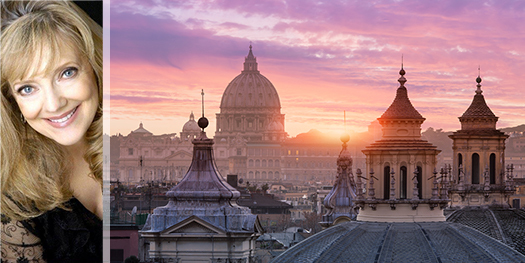 While you are considering your concert touring options for next year, I wanted to send you information on my Passion of Italy Festival in Rome early July, 2019. I am so excited to be working with KIconcerts again. 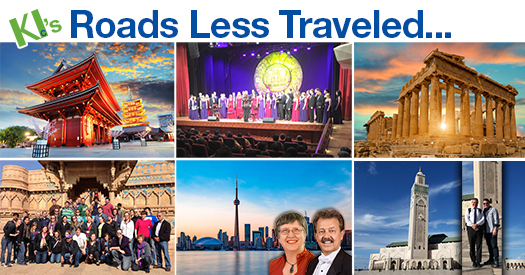 This company provides incredible travel experiences for choral ensembles. The concerts are promoted, and the balance between the ensemble working on their own and as part of the larger chorus is incredible. I am sure that you know how thrilling a destination Rome is with the Pantheon, Spanish Steps, Trevi Fountain, Coliseum, the Vatican and everything else that makes this truly ‘the Eternal City’. The city is magical for those visiting the first time as well as for those returning for one more of many trips there. Choirs attending previous Passion of Italy festivals also toured Florence, Venice, the Amalfi Coast and Milan for further amazing Italian touring experiences. I love to bring a variety of voices and choruses together working until they become a majestic combined choir worthy of singing Mass at St. Peter’s (tbd) and in our Gala Concert in Rome. Coming together with other singers to create something incredible is thrilling. Of course I also never lose sight of the pleasure that comes from staging our individual choirs in their own performances in great venues in another country. I am still considering repertoire options for the festival because I want the program to reflect the needs of all participating ensembles. These decisions will be made very soon. Please let me know of your interests, and I will seek to design the program with your interests in mind. If you have questions, please do not hesitate to contact KIconcerts and/or me personally. The incredible people at KIconcerts know when to refer questions to me. I am excited to be working in Italy again and to have the opportunity to work with fine ensembles such as yours in this dynamic and special way! I know we have all been busy over the summer and are now focusing on the year ahead. One of my summer highlights was conducting the combined US/Italian choir for the 2018 Passion of Italy Festival. In between rehearsals, singing Mass at St. Peter’s Basilica and performing our Gala concert, participating choirs had opportunities for their own concerts in Rome, Florence, Venice and Milan. Next year I am leading the London festival and would welcome your participation. We will rehearse and perform in London and then have the option to travel up north to also perform in the Harrogate International Festival. London offers the most iconic sightseeing in the world and for instance, within two hours of the city, you can also visit Harry Potter’s Oxford, the Queen’s Windsor Castle, The Druid’s Stonehenge and Chaucer’s Canterbury Cathedral. 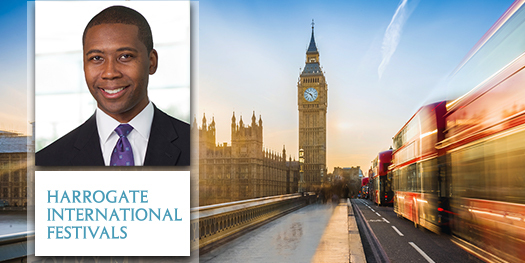 I hope you might consider joining us June 29-July 4, 2019 for the great singing experiences and to explore the pomp and circumstance of Great Britain with your ensemble! 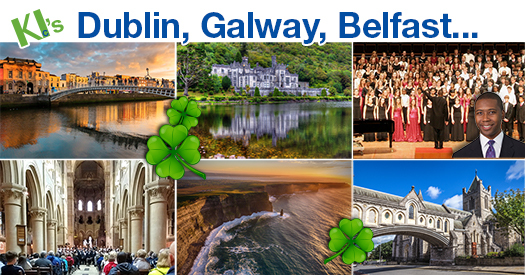 Join McGlynn, Leck & Anúna for the 2019 Ireland Choral Festival! In addition to singing in the combined choir, co-conducted by Leck and McGlynn and alongside Anúna Choristers, there is the opportunity for individual concerts, pre and post touring as well as a one-on-one workshop with singers from Anúna. McGlynn’s love of traditional Irish song and its great literary culture led him to create the choral ensemble ANÚNA in 1987 as a vehicle for his compositions, building a unique choral form for Ireland. Its popularity is testament to the talent of Michael’s, his choristers and its unique way of speaking to Ireland and the world. ANÚNA - Ireland's flagship acappella vocal ensemble represents the passion of Irish musical heritage and literature. Its unique status in Irish musical life has allowed it to create and develop a worldwide education program that is offered to festival participants. An internationally recognized choral director, Henry Leck is professor emeritus in choral music at Butler University, where he served on the faculty for 27 years. He is the Founder and Conductor Laureate of the Indianapolis Children’s Choir and Indianapolis Youth Chorale. He invited McGlynn to co-direct this festival to share the beauty of Michael’s music with American singers. CONTACT KI for details on joining the festival. 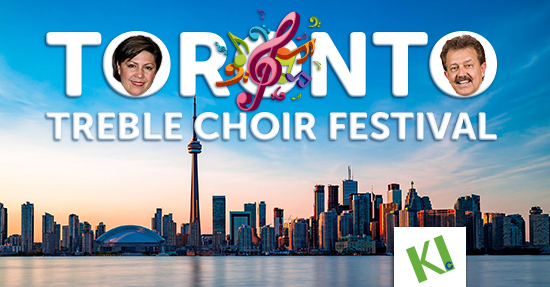 We are both delighted to invite you and your choir to Toronto to sing in our 2019 festival celebrating the sounds of fine treble choirs. What a great week to bring Canadian and US choirs together as Canada Day is celebrated on our arrival day and US Independence Day on the gala concert day. We are developing an outstanding musical experience of rehearsals, workshops and combined performances featuring repertoire from great North American composers which will complement any individual concerts you might wish for your choirs. I am inviting full and partial ensembles (student and community bands) to combine for a spectacular gala concert in the lead up to Canada Day 2019. We will rehearse and perform together as a festival ensemble in addition to opportunities for bands to perform individually. There is nothing quite like musicians coming together in this way to celebrate their talent in great venues in front of appreciative audiences. I look forward to working with you as we prepare for this special celebration of North American band music. I would be happy to answer any questions you may have based on my great experience working with KIconcerts on previous festivals like this. The performance venues were world class, working with Frank Ticheli was a once in a lifetime experience, but what’s even more is that everything from the hotel, to the tour guides, to the coach drivers, to the logistics, even down to the food was outstanding! Sing in Southern Spain, Portugal or both! I am thrilled to invite you to participate in the 2019 Passion of Italy festival. I love Italy, and I also love bringing singers together to create what I call “the power of we” in venues worthy of your singers’ talent, skill, and commitment. The festival choir will sing Mass at St. Peter’s Basilica (tbd) and will perform our Rome Gala concert the next evening. You will also be invited to sing in concerts with your own choir and to enjoy sightseeing with your singing companions, always a unique and rewarding experience. Optional Italian extensions are available to Florence and Venice with individual concert opportunities in Tuscany and Venice. I look forward to further communication with you as you consider this invitation to embark on this musical adventure together. The artistic and logistical support afforded us was exemplary – nobody does it better than KIconcerts! Great climate for year-round tours! Magnificent London is hosting our 2019 festival rehearsals, individual performances and the gala concert. In addition, we will see all the iconic sights of this great city while we enjoy exchange concerts and prepare for our joining together as a combined festival choir. Then, for those that wish it we will journey North to York and then onto Harrogate in England’s heartland. Harrogate is an ancient spa town renowned for its hospitality and for celebrating the arts. The Harrogate Music Festival is the jewel in the crown of the Harrogate International Festivals program and we are to be honored with a featured guest performance in the 2019 Festival. The breathtaking Royal Hall in Harrogate has been proposed as a possible venue for this gala concert. Rollo Dilworth is an excellent conductor, motivator and encourager for our children. He is a teacher at heart and an incredibly kind person. KI delivered exactly what they sold. 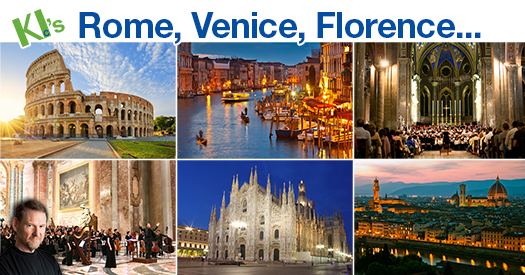 Culture, classics, composers, cathedrals, Colosseum, concerts, columns, cardinals, canals – captivating! Educational, fun, exuberant, life changing! These are just some of the reasons why Italy is one of our 10 most favored concert tour destinations – let us share our unique concert opportunities with you there! 2019 FESTIVALS: McGlynn, Leck, Dilworth, Poloz, Galván, Dickson, Sharkova, Stark, Loeppky, Sailer - WHAT A ROSTER! 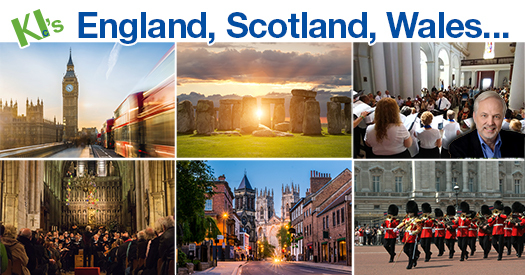 These are just some of the reasons why Great Britain is one of our 10 most favored concert tour destinations – let us share our unique concert opportunities with you there! 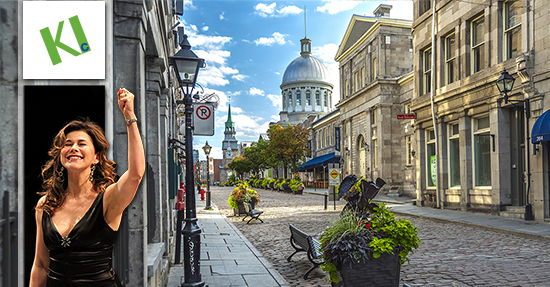 These are just some of the reasons why Canada’s one of our 10 most favored concert tour destinations – let us share our unique concert opportunities with you there! Learn about Costa Rica’s finest exports: coffee & tropical fruits! Share your ensemble’s musical talent & be adventurous with us in Costa Rica! I am pleased to announce the 2019 Choral Festival in Ireland will be co-conducted by Michael McGlynn and me. KIconcerts’ Oliver Scofield and I are just back from a meeting with Michael in Dublin at which he also accepted a commission to write a new piece for the Ireland Festival Combined Choir to premiere on June 28 in Dublin! McGlynn proposes a simple text based on the ancient story of the Blackbird representing the voice of the natural world, with a song so pure and simple that it transcends the sound even of the monk's singing at prayer, or the matin bell. Michael McGlynn is one of Ireland’s finest contemporary composers and the choir he founded, Anúna, is one of the leading choral voices of Ireland. In addition to “The Song of the Blackbird” we will sing three other McGlynn pieces – “Dúlamán”, “Jerusalem” and “An Oíche” along with American repertoire I will select. I wonder if there is anything to compare with your singers working with a renowned composer to bring their new choral creation to life? Is there another country as safe and comfortable that calls to us in the same way as does Ireland…its music, rolling hills, whimsical nature, shared ancestry, quaint towns, intense history, some of the most hospitable people you will ever meet not to mention the odd leprechaun and the elusive four leaf clover. In addition to singing in the combined choir alongside Anúna Choristers, there is the opportunity for individual concerts, pre and post touring as well as a one-on-one workshop with singers from Anúna for those choirs registering early. Make new friends and create lifelong memories with the people of China! These are just some of the reasons why China’s one of our 10 most favored concert tour destinations – let us share our unique concert opportunities with you there! AUSTRIA - One of the world's most outstanding concert tour destinations! These are just some of the reasons why Austria’s one of our 10 most favored concert tour destinations – let us share our unique concert opportunities with you there! With great pleasure I share news of the repertoire we will perform together in our Hong Kong and Beijing Choral Festival, May 2019. I am combining some of North America’s best-loved music with the fantastic singers you have in your ensembles and creating exciting opportunities for musical sharing and cultural exchange together with the many new friends we will make along the way. FROSTIANA, Randall Thompson’s 1959 setting of poetry by Robert Frost. These seven short movements feature Frost’s uniquely American vision in some of his greatest poems ever, including “The Road Not Taken” and “Choose Something Like a Star.” Evocatively scored for piano mixed chorus (with several movements for SSA/TTBB alone), these works will give us a chance to feature the talents of your singers in the Festival Chorus setting. For our concert closers, we will feature two of the greatest loved African-American spirituals: AIN'A THAT GOOD NEWS and THERE IS A BALM IN GILEAD, both by arranger William L. Dawson. You will also be invited to sing in your own right in the 1st half of the gala concert as well as in individual concerts as requested. As we know from experience, our tour audiences are always thrilled to experience beautiful American music from American choirs. I look forward to this unique chance to share some of our best loved choral works together and with our new friends in Hong Kong and Beijing. As you can see, this Festival tour offers incredible opportunities for cultural immersion, sharing and mutual understanding. Beijing and Hong Kong boast many fine venues, outstanding ensembles not to mention the food and informative touring opportunities. Following our rehearsal and concert program in Beijing, I am inviting choirs to visit Hong Kong where I teach and conduct regularly. It will be a great joy for me to combine US choristers with my many singing friends in Hong Kong for this festival finale. Both Beijing and Hong Kong represent very different pieces of the Chinese mosaic and, understanding both, helps understand a great deal about the China of tomorrow. Please consider joining me on a fun, educational, safe and very musical program in two of the great cities of Asia. KIconcerts looks forward to being with you in Pasadena, March 14-17. You will find us in the Exhibit Hall. Come and talk with us about our custom concert tour destinations on 6 continents or about our great festivals led by luminaries of the caliber of: Leck-McGlynn/Ireland, Sharkova/Canada, Dickson/Austria, Lloyd/Wales & England, Stark/China and Loeppky/Costa Rica. A fuller list of the 2019 festivals are here. If you are not attending this year, feel free to call or email any time or even visit us in sunny Colorado. KIconcerts looks forward to being with you in Pittsburgh, March 7-10. You will find us at booth 107. 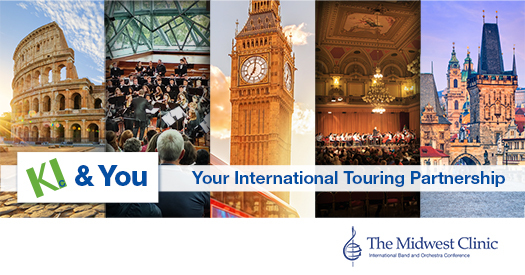 Come and talk with us about our custom concert tour destinations on 6 continents or about our great festivals led by luminaries of the caliber of: Dilworth/England, Leck & Poloz/Canada, Leck-McGlynn/Ireland, Lloyd/Wales & England and Galván/Italy. A fuller list of the 2019 festivals are here. If you are not attending this year, feel free to call or email any time or even visit us in sunny Colorado. 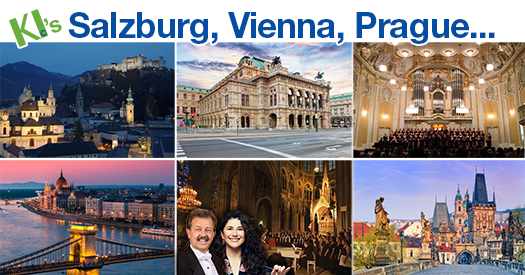 Europe - a fresh look at Southern & Northern Europe concert tours! With 40 years’ experience staging fine concert tours around Europe, KIconcerts has taken a fresh look at our European destinations, tour patterns and concert opportunities as well as the safety and economics of different destinations. This email focuses on Europe's South and North. In previous emails we have updated Austria, Italy, UK and Ireland. GREECE Walk with the ancient gods in Greece soaking in the origins of civilization at every street corner, in every town and on every Greek island. The sun warms the heart of the locals as they welcome our visiting ensembles, hosting concerts, dinners and dazzling touring experiences. A GREEK ISLAND cruise is an option for either 3 or 4 days including a chance to stage a concert for all the other passengers. Concerts in ATHENS round off a visit to this surprisingly affordable jewel of the Mediterranean. NORTHERN EUROPE There are cost effective ways for ensembles to visit Europe’s north. For instance, a more affordable way to be immersed in the distinctive music and touring opportunities of the north is to start in Finland’s capital of HELSINKI, sail on a short ferry ride to TALLINN, Estonia and then perhaps end in RIGA, Latvia or sail overnight to STOCKHOLM, Sweden. In summer the days barely end, the old towns are historic gems, and each country’s culture is more distinctive than the last. Europe is all this and more; AUSTRIA, ITALY, GERMANY, POLAND, CROATIA, FRANCE, the CZECH REPUBLIC and HUNGARY etc. etc. Experience the tapestry that weaves this patchwork of countries together and which offers you the finest opportunities in your world of music.